Is your teen struggling? Do you feel like they are pushing you away? Do you have a tween who is about to embark on the teen years? Do you work with teens? If so, this is a must read! Teenagers are living in a very different world than the one their parents grew up in. Today’s parenting requires a different style. Even the best intentioned Christian families are not immune to the effects of todays out of control culture. 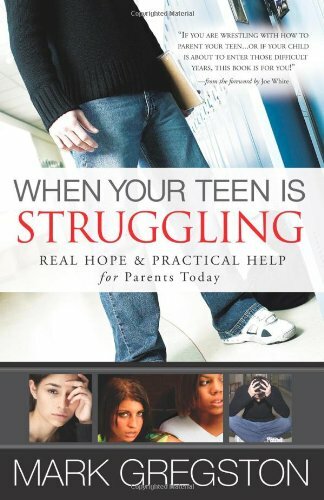 Published by Harvest House in 2007, When Your Teen is Struggling by Mark Gregston is not a new book but an excellent resource that offers hope and advice. Mark Gregston, founder and executive director of Heartlight Ministries, is a popular author, radio host and speaker. He has served families and counseled youth for more than 40 years. He has helped turn around more than 2,500 teens through his residential counseling center. He offers experience and insight along with compassion and understanding. He has a gift for being able to get to the root of a teen’s issue and design a plan to bring healing. 1. Just as kids change as they age, parents need to change the way they parent. Gregston warns that lectures must move to discussion, and a parent’s role must change from protector to preparer. Parents must be prepared for the teen years in advance and have a plan in place. This may prevent future issues. 2. Parents must look at their child’s struggle with the eyes of their heart. Look beyond the surface to discover what is hidden. The behavior is not the issue; it’s a symptom of something greater. Parents must get to the root of the issue. 3. Pain is valuable. No matter how badly we want to bail our kids out of the consequences to their poor choices to avoid pain for them, we must not. Gregston notes that to avoid pain allows childish thinking and foolish behavior to continue and results in greater pain later in life. For some parents this, itself, is very painful, but it must be done. Teens today are immature because they have been rescued too many times. Let them learn from their mistakes and grow up. Gregston offers two very practical chapters on developing family belief systems and developing a rule and consequence for each belief. Issues concentrate on respect, obedience and honesty. The book is also filled with many real life case studies of teens and their families. Each scenario describes the behavior, the root problems and the action that was applied to help the teen. I was pleasantly surprised to read the outcome of these teens’ lives in the “Where Are They Now” chapter at the end of the book. Gregston has also written What’s Happening to My Teen: Uncovering the Sources of Rebellion, Parenting Teens in a Confusing Culture, Tough Guys and Drama Queens, and more. His app Heartlight Parenting Today’s Teens features daily one minute radio programs and a weekend radio program addressing various issues that parents face today. The website http://www.heartlightministries.org/ is a one-stop-shop for parents searching for help with their teens.